In general, it is recommended that you use a popular and well supported Linux distribution, either 32-bit (x86) or 64-bit (amd64). A 64-bit version can give a great performance, but deliver more problems (like driver compatibility issues). 32-bit systems are with us for a longer time and have less problems, which is important for novice users. There are two big families of Linux distributions: Debian and Red Hat. Debian is a free and open-source project, which has several branches, the most popular of which is Linux Ubuntu. Red Hat is a commercially distributed operating system, which has "free" branches named Linux CentOS and Linux Fedora. Red Hat Linux is being developed by Red Hat Inc. Red Hat Linux (or its "free" modification CentOS) is known as a "corporate" operating system. Its main advantage is "stability" (low rate of system crashes). However, this stability is achieved through carefully choosing the software which is installed out of the box. When you install such an operating system for the purpose of PHP development, this "stability" may become a problem, because you have access to some old (but "stable") version of PHP and other software. They do not include a new "bleeding-edge" software into their repository, so if you want to install one, you will need to download it from somewhere, read the manual, and possibly (if you are not lucky) compile it yourself. There is another Linux distribution, which, in the author's opinion, suits better for PHP development. Its name is Linux Ubuntu. Ubuntu is being developed by Canonical Ltd. Linux Ubuntu has two editions: Desktop edition and Server edition. Ubuntu Desktop is a distribution containing graphics environment, while Ubuntu Server edition has console terminal only. For the purpose of PHP development, it is recommended to use the Desktop edition. Canonical typically releases a new version of Linux Ubuntu each 6 months, in April and October, and a "long term support" (LTS) version each 2 years. For example, at the moment of writing this text, the latest version is Ubuntu 16.04 Xenial Xerus LTS (released in April 2016). Non-LTS releases have short support period (about 9 months), but they have the newest versions of the PHP software out of the box. On the other hand, LTS releases have longer support period (5 years), but a little outdated PHP software out of the box. For PHP development, the author would recommend to use the latest version of Ubuntu Desktop, because it has the newest version of PHP and other software available from repository. The disadvantage of using such a version is that you will need to upgrade it to the next release every 9 months (as support period expires). If you don't like the perspective of upgrading every 9 months, choose the latest LTS release. As you can see from the table above, for the purpose of ZF3 development, you'll have to install Ubuntu 15.04 or later. When choosing between 32-bit and 64-bit versions of the system, remember that the 64 bit version of Linux Ubuntu will have more compatibility issues than its 32-bit counterpart. The support of drivers can also cause problems on the 64-bit platform. If you are new to Linux Ubuntu, watch these excellent video tutorials by LearnLinux.tv YouTube user: Tutorial - Installing Ubuntu 16.04 LTS (this one shows how to install Ubuntu Desktop Edition) and Tutorial - Installing Ubuntu Server 16.04 (this one shows how to install Ubuntu Server Edition which has console terminal only). In modern Linux distributions, you can easily download and install software from a centralized repository. The repository contains so called packages. A package has a name (for example, php, apache2), and a version. In general you can install a package with a single command. However the command (and a package name) may differ based on linux distribution you use. For example, to download and install packages in Debian-based Linux distributions (e.g. Ubuntu Linux), you use Advanced Packaging Tool (APT). In Red Hat provided distributions (e.g. Fedora or CentOS), you use YUM (RPM package manager). Below, detailed installation instructions for these operating systems are provided. The commands above run the APT tool and install the newest system packages updates. The sudo command (stands for "Super User DO") allows to run another command, apt-get in our case, as system administrator (root). You typically use sudo when you need to elevate your privileges to install a package or edit some configuration file. The sudo command may request you for password. When prompted, enter the password under which you log into the system and press Enter. The commands above download from repository and install the latest available versions of Apache HTTP Server, PHP engine and PHP extension module for Apache. The commands above may ask you for confirmation when installing a package. It is recommended to answer Yes (press "y" and then press Enter). The command above runs the YUM tool and installs the newest system package updates. The commands above download from repository and install the latest available versions of Apache HTTP Server and PHP engine. After you set up your Apache HTTP web server, check that it is installed correctly and that the server sees the PHP engine. To do that, create phpinfo.php file in Apache document root directory. The document root is a directory where you can (by default) store the web files. Typically, the Apache document root directory is /var/www/html. If you need administrative permissions to edit the file, prepend the sudo command to the command above. Open the file in your web browser. The standard PHP information page should display (see figure A.1 for example). To configure PHP for your development environment, you need to edit the PHP config file (php.ini) and adjust some parameters. For the development environment, it is recommended to set the following error handling and logging parameters as below. This will force PHP to display errors on your PHP pages to screen. To conveniently search within the file, press F7 in Midnight Commander's editor window and enter the search string (the name of the parameter to search for). Set max_execution_time, upload_max_filesize and post_max_size parameters to allow large file uploads through POST. For example, setting upload_max_filesize with 128M allows to upload files up to 128 megabytes in size. Setting max_execution_time with zero allows to execute the PHP script indefinitely long. When ready, save your changes by pressing the F2 key and then press F10 to exit from Midnight Commander's editor. 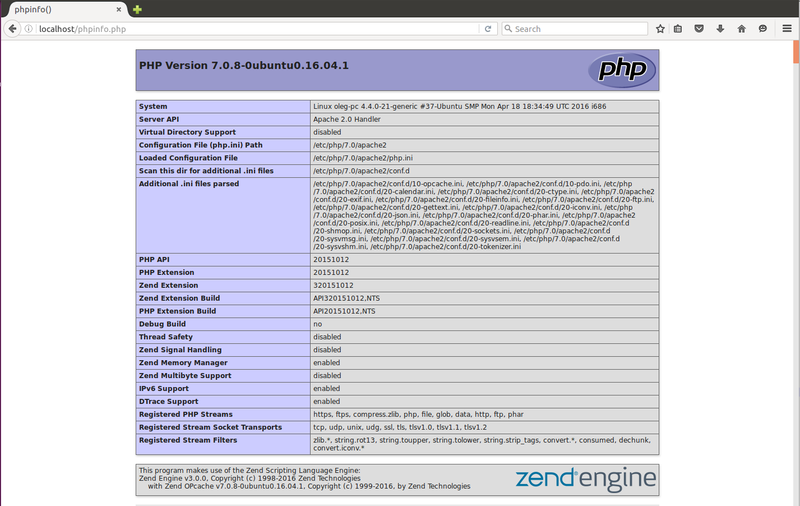 Zend Framework 3 requires that you have Apache's mod_rewrite module enabled. The mod_rewrite module is used to rewrite requested URLs based on some rules, redirecting site users to another URL. Finally, restart Apache web server to apply your changes. In these Linux distributions, mod_rewrite is enabled by default, so you don't need to do anything. Zend Framework 3 requires that you create a virtual host for your web site. A virtual host term means that you can run several web-sites on the same machine. The virtual sites are differentiated by domain name (like site.mydomain.com and site2.mydomain.com). Each virtual host has its own document root directory, allowing you to place your web files anywhere on the system (not only to /var/www/html directory). Please note that right now you don't need to create a virtual host, we'll do that in chapter Zend Skeleton Application. Now you just need to have an idea of how virtual hosts are created in different Linux distributions. You have an example default virtual host at /etc/apache2/sites-available/000-default.conf (see below). All you have to do is just to edit this virtual host file when needed and restart Apache to apply changes. The virtual host's name starts with a prefix (like 000, 010, etc. ), which defines the priority. Apache web server tries to direct an HTTP request to each virtual host in turn (first to 000-default, then to 001-vhost2), and if a certain virtual host cannot serve the request, the next one is tried and so on. There is an example virtual host in /etc/httpd/conf/httpd.conf file. Scroll down to the very bottom of the document to the section called Virtual Hosts. You can edit this section as you need and restart Apache to apply your changes. To be able to debug your web sites, it is recommended that you install the XDebug extension. The XDebug extension allows to look inside a running program, see the variables passed from the client, walk the call stack and profile your PHP code. 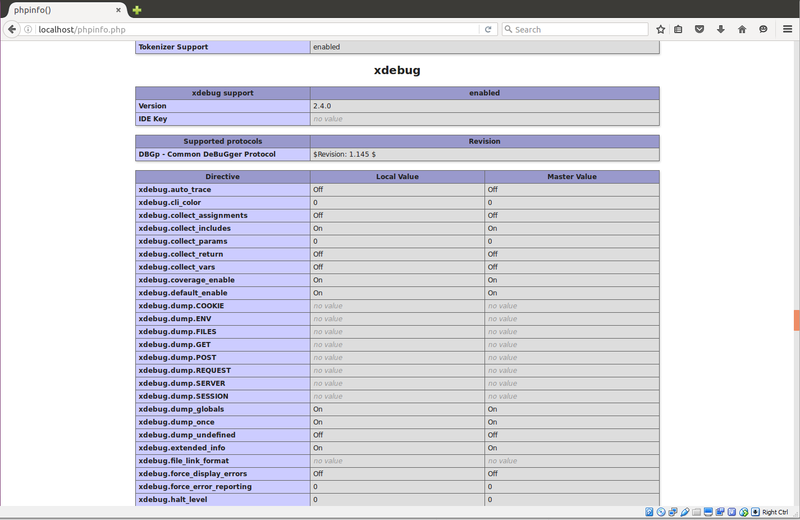 XDebug also provides the code coverage analysis capabilities, which are useful when you write unit tests for your code. Restart the Apache web server to apply your changes. Then check the phpinfo.php in your browser. If installation was successfull, you'll see some XDebug-related information. MySQL is a free relational database management system being developed and supported by Oracle. MySQL is the most popular database system used with PHP. In this book, we will be using MySQL. The commands above install MySQL server component, MySQL client component and MySQL extension module for PHP, respectively. During the installation of the MySQL server, a root user is created. By default the root user has no password, so you have to set it manually. You will need that password for creating other MySQL database users. The command above creates empty schema that we will populate later. The command above creates the user named 'test_user' and grants the user all privileges on the 'test_db' database. Finally, type quit to exit the MySQL prompt.